Germany’s Zeppelin bombing raids on Britain have not exactly brought the island nation to its knees. Now the Germans escalate the campaign, with a Zeppelin bombing raid on London itself. The Kaiser had been opposed to attacks on the British capital, for fear of killing his relatives in the British royal family. The Kaiser has however agreed to attacks on London’s docks, which has been interpreted liberally as meaning that anywhere to the east of Charing Cross may be bombed freely. Under cover of darkness, the LZ-38 Zeppelin flies over London. It drops a number of bombs on Stoke Newington and Hackney, killing some seven people, including three year old Elsie Leggatt. This is the first attack on London in hundreds of years. Germany still has forces at large in its West African colony of Kamerun. Some of these are besieged at Mora in the north of the country. 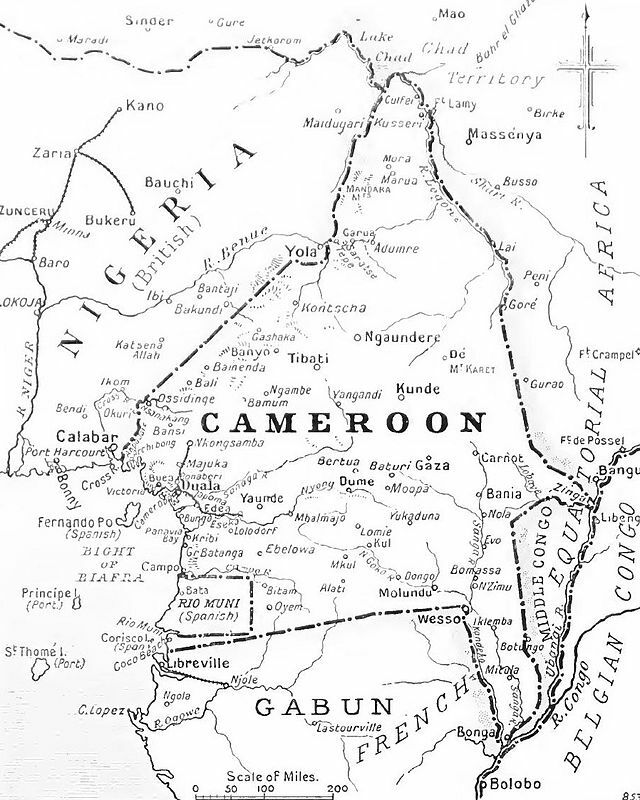 Forces based at Garua have retained their freedom of action and recently launched a minor invasion of British Nigeria. Although defeated, the German invasion has angered the British: it is simply unacceptable for enemy forces to be invading its colonies. The German base in Garua must be taken. Now an Allied force (mainly British, but with some assistance from the French, including heavy artillery) has reached the environs of Garua. The Germans have fortified their base and stockpiled food and ammunition in preparation for a long siege. But the British want things over in a much shorter timescale. They dig trenches opposite the weakest part of Garua’s defences and then begin to batter them with the French guns. At night the Allies work to further undermine the enemy’s defences by digging their trenches closer and closer to the German lines. The Galician fortified town of Przemysl fell to the Russians after a long siege back in March. The Russians have not had long to celebrate their triumph. With the Gorlice-Tarnów offensive seeing the Russians pushed back everywhere, the Austro-Hungarians are now back in the vicinity of Przemysl, advancing from the south-west. And this time they have brought their German friends with them. An attack to take the town’s outlying fortresses by sudden assault failed. Since then the Austro-Hungarians have battered the defenders with their heavy 420mm siege guns. Now the infantry assault begins again, with the Austro-Hungarians and Germans methodically advancing to capture the enemy’s positions one by one. Przemysl will not fall overnight, but its capture looks increasingly inevitable. 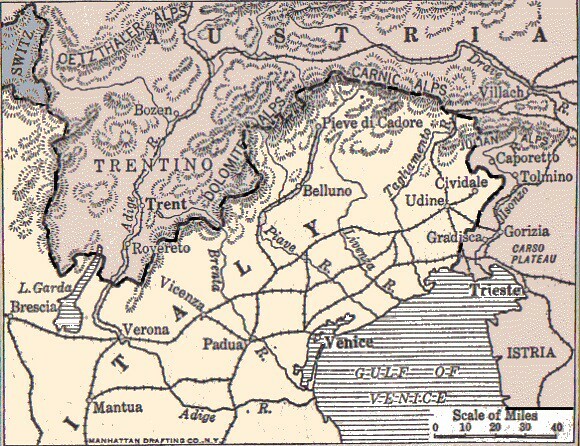 The Italians have finally crosses the Austro-Hungarian frontier in strength. However, they do not advance very far, fearing to attack the enemy until their own forces are fully mobilised (which is not expected to be the case for some time). They take the town of Karfeit (known to the Italians as Caporetto) but do not press forward against the high ground beyond the Isonzo river. Meanwhile the Austro-Hungarians are desperately trying to prepare their defensive lines, knowing that it is only a matter of time before the Italians launch a major offensive. Austro-Hungarian chief of staff Conrad appoints General Svetozar Boroevic to command on the Italian front. Like many of the men he leads, Boroevic is a Slav, from territory coveted by the Italians. They have no desire to be ruled by Italy and are determined to defend their homeland from invasion. The Austro-Hungarians are heavily outnumbered; there is no question of their launching an offensive. Instead they will have to fight a defensive war. Boroevic orders that every position be fortified and held to the last man, with reserves behind the line always ready to launch counterattacks. His resolve and that of his men will be tested soon. Britain, Russia and France have jointly warned the leaders of the Ottoman Empire that they will be held personally liable for abuses committed against the Empire’s Armenian population. If this was intended to deter future mistreatment of the Armenians, it fails. Today the Turkish parliament passes a bill presented it to it by Mehmet Talaat, the interior minister. The law provides the authorities with extreme powers for use in the furtherance of the Empire’s security and internal order. These include not merely military and police measures against insurgents but the power to forcibly move entire populations from one location to another. The Turkish authorities have already begun to deport Armenian communities from provinces close to the Russian front. Today’s law puts these deportations on a more sound legal basis. The leaders of Turkey see the Armenian population as profoundly disloyal and a fundamental threat to the security of the Empire. The deportations are intended to remove the Armenians from areas where they can assist the enemy. Today’s law is vague as to where the Armenians are to be sent to, but separate orders instruct that they be sent to inhospitable Syrian desert regions or other locations in which it is hard to sustain life. No serious provision is made for supplying the deportees with food and water while they are in transit. But aside from the written orders to deport the Armenians, other verbal orders are transmitted to local authorities in the Empire. These order not merely the deportation of the Armenians but their extermination. At the commencement of deportations, local officials are to kill some of the Armenians with the expectation that the rest will die or be killed while on the move or else in their final destinations. Turkish officials who question these unwritten orders or who ask for them to be confirmed in writing are seen as disloyal; they are dismissed from their posts and in some cases they are themselves also murdered. On land the fighting at Gallipoli has stalemated, with the Allies unable to break out of their enclaves and the Turks unable to drive them into the sea. The British have been using the heavy guns of their navy’s battleships to bombard Turkish positions, hoping that eventually they will be able to wear them away. 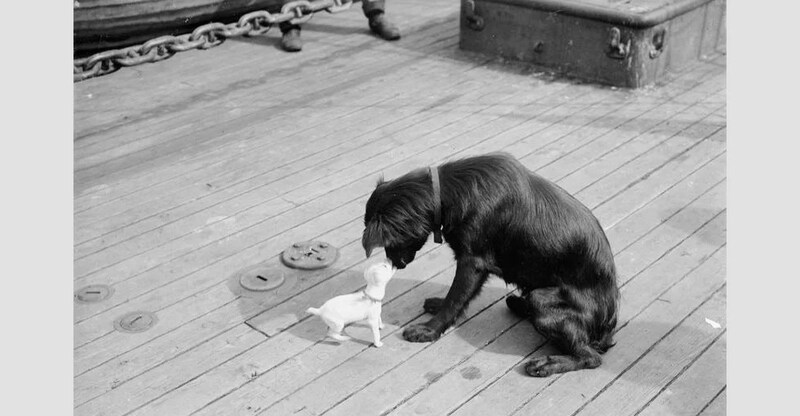 Germany, Turkey’s ally, has responded by sending U-boats to attack the British fleet at Gallipoli. After sinking the Triumph on the 25th, today the U-21 strikes again, torpedoing another battleship, the Majestic. 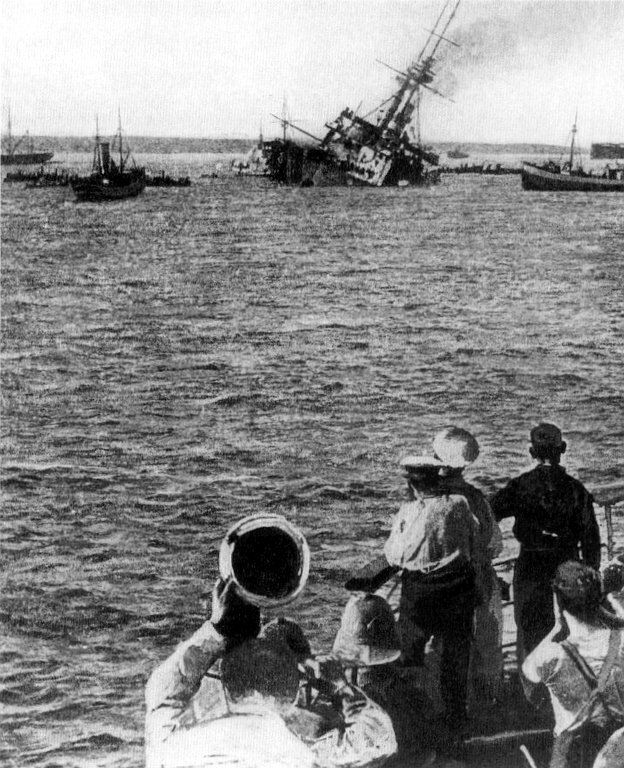 The Majestic sinks quickly, with the loss of 49 sailors. Among survivors are two dogs. The British fear losing more of their valuable battleships at Gallipoli. After the sinking of the Majestic they order their other capital ships to retire to safe ports. The bombardment of Gallipoli will continue, but with less valuable ships bearing less destructive guns. British warships are patrolling on the Mediterranean side of the Gallipoli peninsula, blasting Turkish positions with their heavy guns. 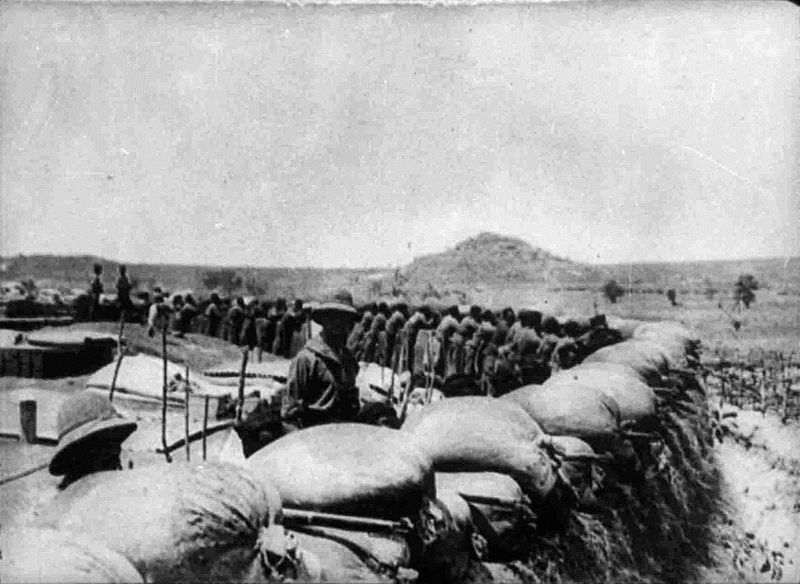 Although the Gallipoli campaign is currently in stalemate, the Allies hope that the guns of their ships will eventually wear down the Turks. Britain’s enemies have other ideas. Today the old British battleship the Triumph is shelling Turkish positions when look-outs spot a submarine’s periscope some 300 to 400 yards to starboard. It is the U-21, a German U-boat The ship’s guns turn to fire on the periscope, but too late. The U-boat unleashes a submarine and Triumph is struck. It sinks rapidly. Most of the crew are rescued but some 78 men die with their ship. The Germans are not the only possessors of submarines. Britain’s E11 has slipped through the Dardanelles and has preyed on Turkish shipping in the Sea of Marmara. Now, though it has sailed on to attack shipping in the port of Constantinople itself. Commander Nasmith, the E11‘s commander, hopes to catch the Goeben, the German battlecruiser that is now the flagship of the Turkish fleet. If the Goeben is sunk then the naval balance in the Black Sea will be completely changed to Russia’s advantage. Unfortunately for Nasmith, the Goeben is not in port. So he satisfies himself by torpedoing the Stamboul, a Turkish transport vessel. The Stamboul has to run aground to avoid sinking. 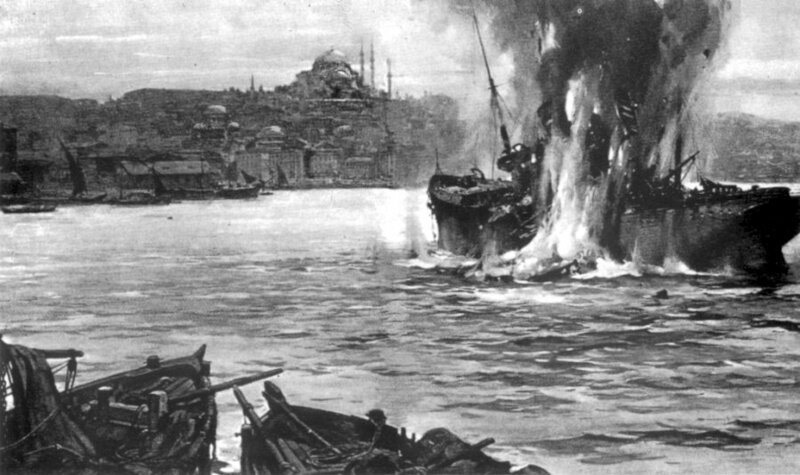 The E11‘s attack on Constantinople is the first naval attack on the Ottoman capital in over a hundred years. Panic erupts in the city.